We had some okay rides but nothing great. For the most part, the last few weeks have, at the least, been exhausting and, at worst, have been just monstrously frustrating, marked by a resistant horse that just. won’t. move. forward. Christy wondered if the saddle wasn’t impinging upon Derby’s shoulder, and indeed, it was. When he was tacked up, I checked, and she was right – reaching down between his shoulder and the saddle, I could feel the shoulder blade hitting the panel. We talked it over, and decided that the hollows on either side of Derby’s typical TB withers were the culprit. Warming up. He was moving out, at last. The next night, I mustered my entire inventory of saddles (4) (Jesus), pads (2 sheepskin half pads, a Mattes correction pad, a Fleeceworks Perfect balance pad) and shims (two ThinLIne pads that have been cut to fit the Mattes pad, multiple different Fleeceworks options, felt Mattes imports, and for good measure, a yoga mat and box cutter, just in case,) and headed to the barn. I widened the Wintec gullet, and added shims. Nope. Derby was still resistant, bracing and twisting his neck, and saying ‘Owwww.’ I tried the Albion with something that didn’t work, can’t remember at this point which pad it was. Plopped the Wintec on top of my Pro Choice Air Ride western pad, with the built up wither relief pads. Thank God that didn’t prove to be the miracle, because I won’t kid you, it looked pretty stupid. Finally I pulled the Albion back out – after all, this is the saddle that was (once) fitted to Derby. It does have more flocking in the panels that fill the hollows next to the wither. 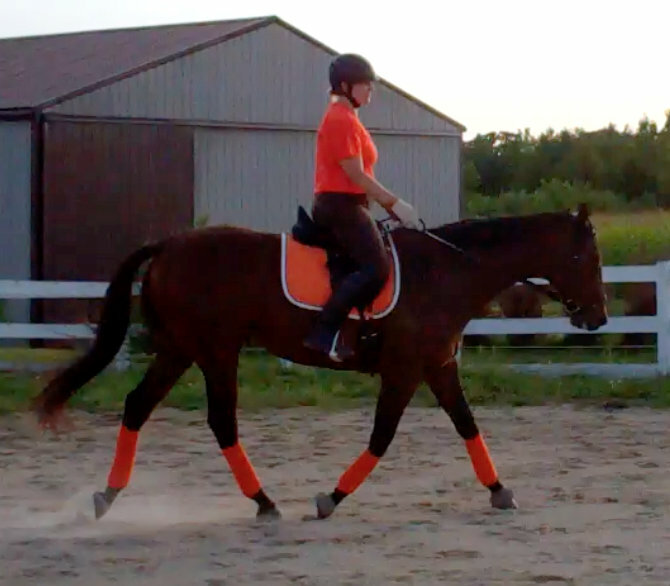 I plopped it on Derby, with just a saddle pad, no half pad or anything else. Admittedly skeptical, I got on anyway. Things were better. When I asked him to go forward, he actually complied, rather than swishing his tail and pinning his ears. I need to regain my position – the Albion makes me work for it – but the horse is approving. I rode for maybe 10 minutes, and Christy agreed that we were heading in the right direction. But after being on and off Derby for better than an hour and a half, I took mercy on my patient horse and called it quits. 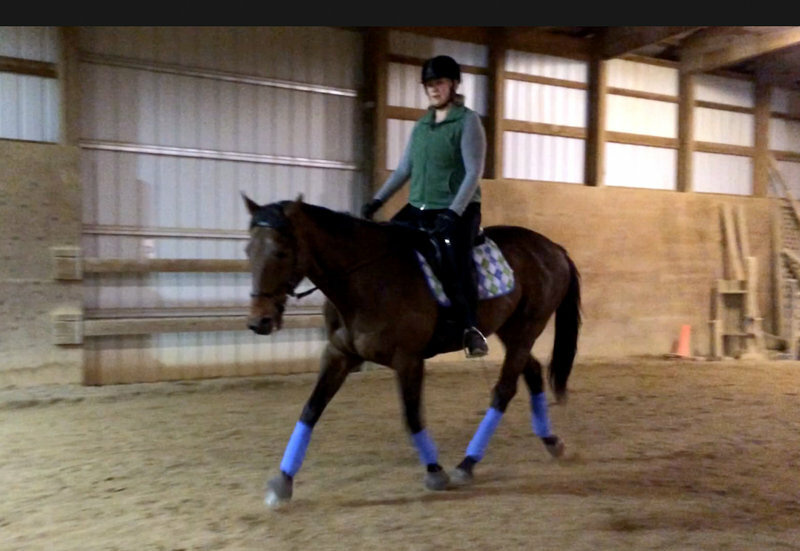 The next evening, I saddled up using the Albion with my Fleeceworks Perfect Balance pad, using just the front shims. We had the best ride we’ve had in a while. Derby felt more supple and flexible than he has in a while, and I was able to get him forward without begging. 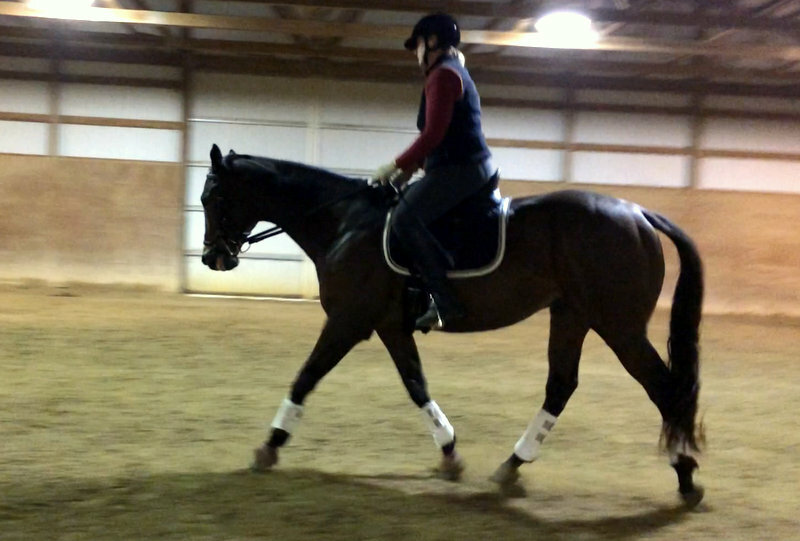 We even did a bit of canter work and the transitions were prompt and smooth. So this is all great and certainly encouraging, but a new problem has cropped up, and it’s all mine. I’ve been struggling with (among other things) flexibility in my ankles. 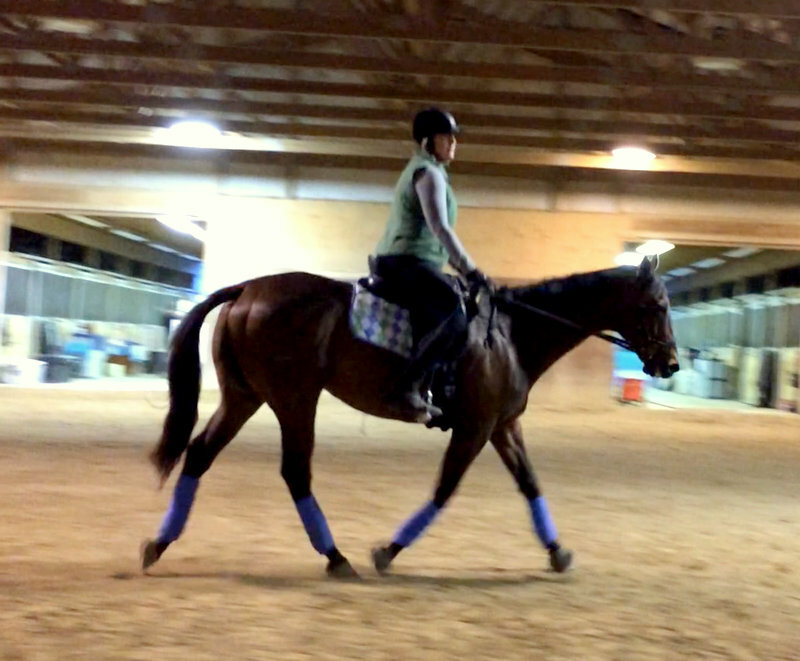 Getting my heels down has been a challenge – I’ve been unable to drop them below stirrup level. I raised the issue with my Pilates coach, and have been doing extra curricular work, using a standing desk for work and standing on an array of items, such as Foot Wakers and a balance cushion, working on stretching my heels down and improving flexibility in my ankles. 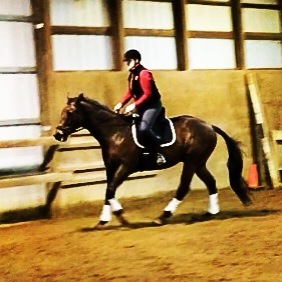 I’m making progress – I an now actually drop my heel below my stirrup, enabling me to use my leg more correctly. But I’m still not solid in my base of support – this is a work in progress. However, if I have the saddle sting started, and can now concentrate a bit more on me, hopefully I’ll be able to build my stability in the saddle, and refinement of my aids. We are officially back to work. 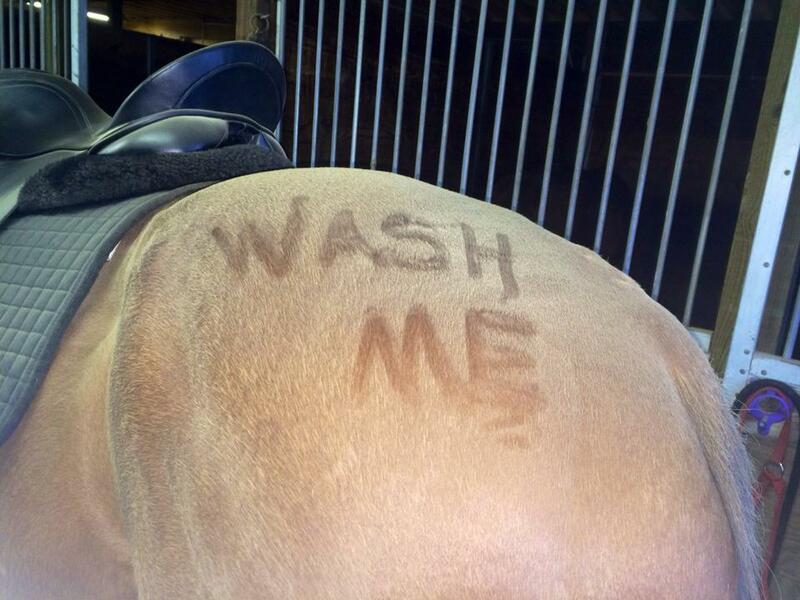 I don’t have any travel for the next month, and, well there are some schooling shows coming up …. but I digress. We’re back to work, and Christy is approving – our work is consistently more correct, and it’s my fervent hope that we’ll see the results in the form of some more muscle on that skinny neck. I added a lesson, so we worked with Christy four times this week – we have to keep up this momentum. After our nice ride on Monday, I got a little over-motivated and rode Tucker before my ride on Derbs, after a killer Pilates session. Needless to say, I was almost out of gas by the time my lesson rolled around, but we had a few nice moments before I pooped out. 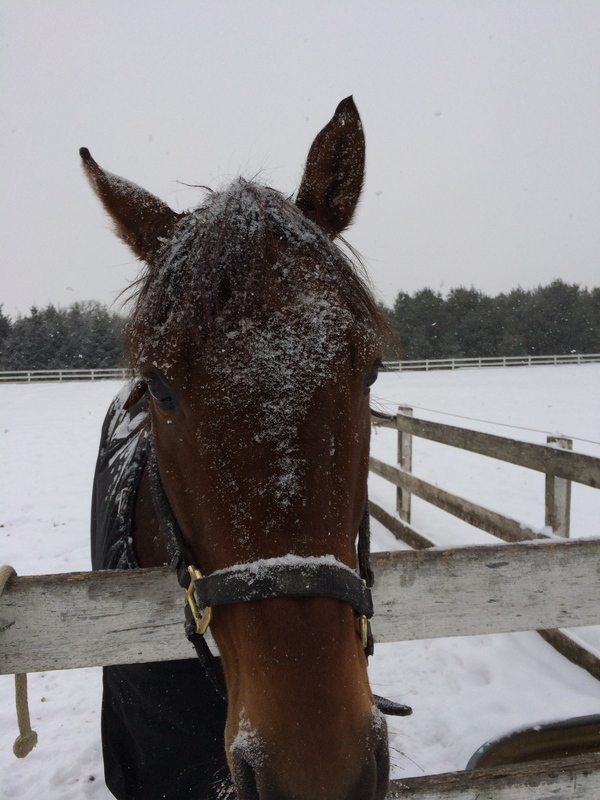 Then on Wednesday, it was Derby’s turn – the horses were inside due to pouring rain and wind, and after a few more strenuous rides, standing around in his stall did him no favors. 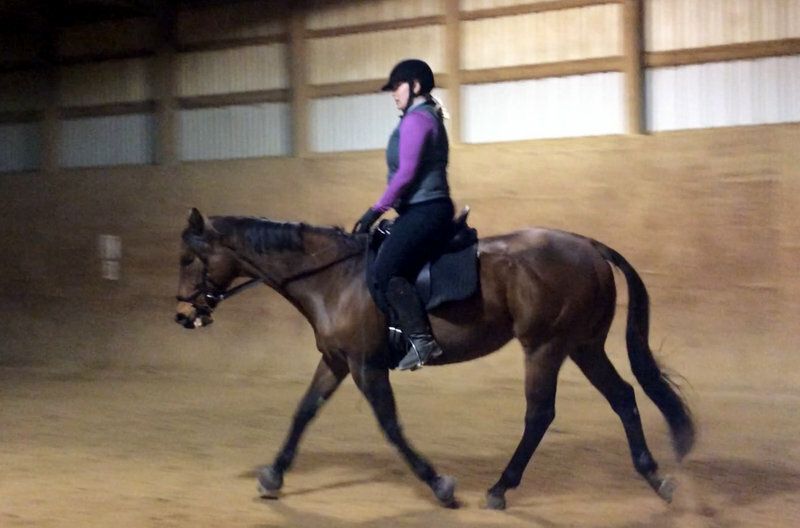 He felt blah and was really underpowered in his hind end, so we worked on some stretchy trot, and then rode the intro tests for variety. Two point. Ow ow ow. But we’re putting things together. The pieces feel like they’re starting to come together. 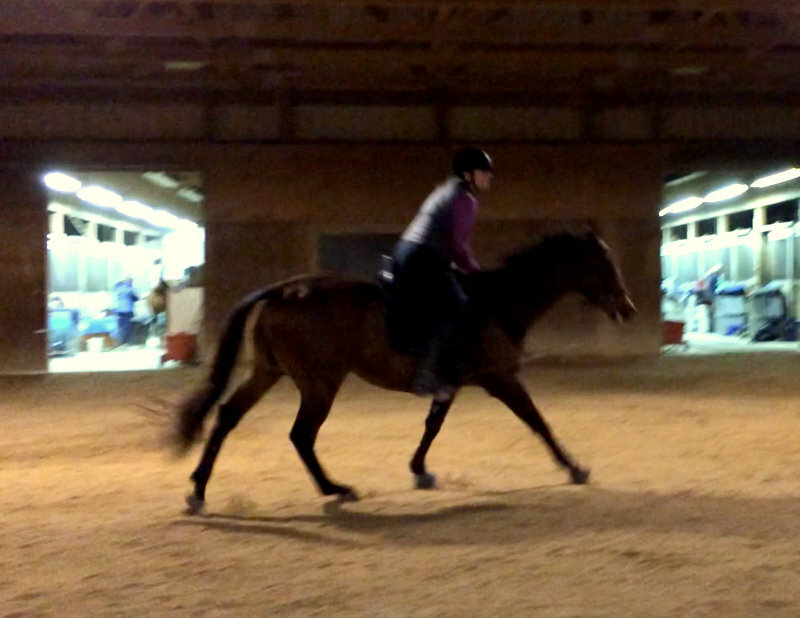 I’m trying not to be too impatient, so Derby will get a day off tomorrow, and I’ll ride Tuck to keep myself going. The eq is ghastly, but I love the filter. Necessity: If I’m going to ride Derby through the coldest months, I have to be adept at keeping him on the bit and on the aids – those are the foundations of control, and are also important for keeping the horse’s attention on the rider, not on gremlins lurking in muck buckets or behind jump poles. Our new friends, Natalie and Pearl The Beautiful. 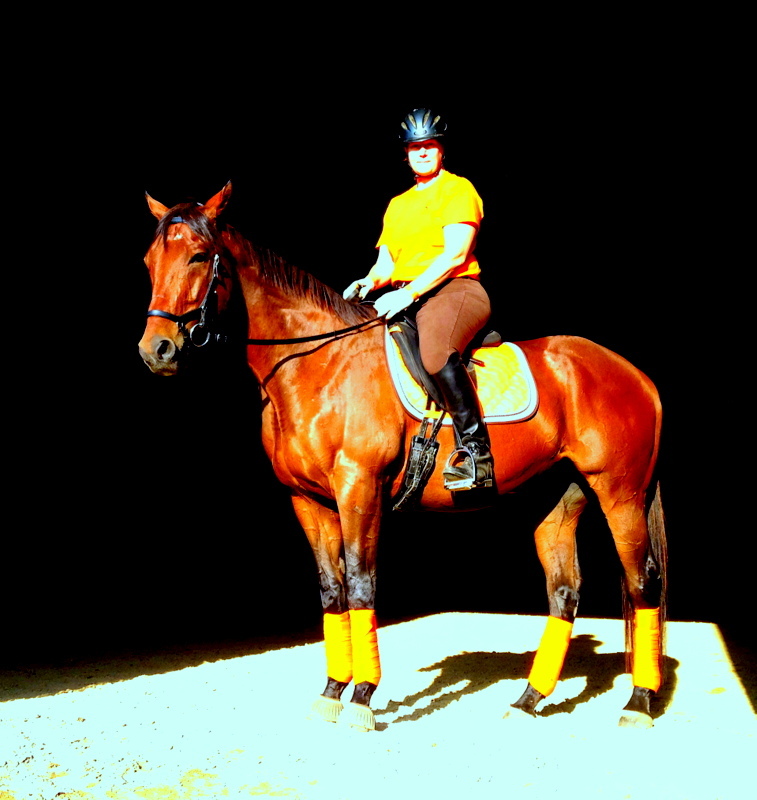 Derby and I may have an enviable collection of saddle pads, but Natalie and Pearl sport an amazing array of polos. The Natalie Effect: Here’s my special sauce. 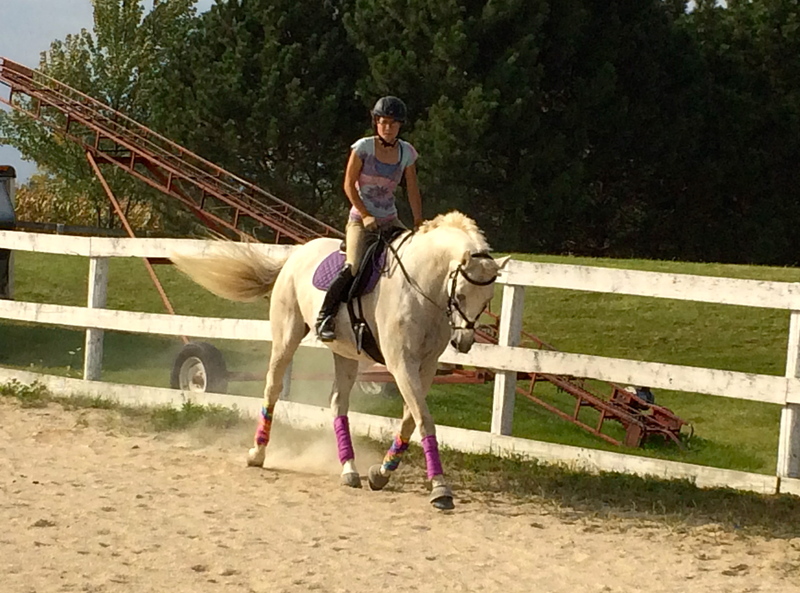 Over the summer, a new boarder, Natalie, and her gorgeous Trakehner mare, Pearl, moved in. 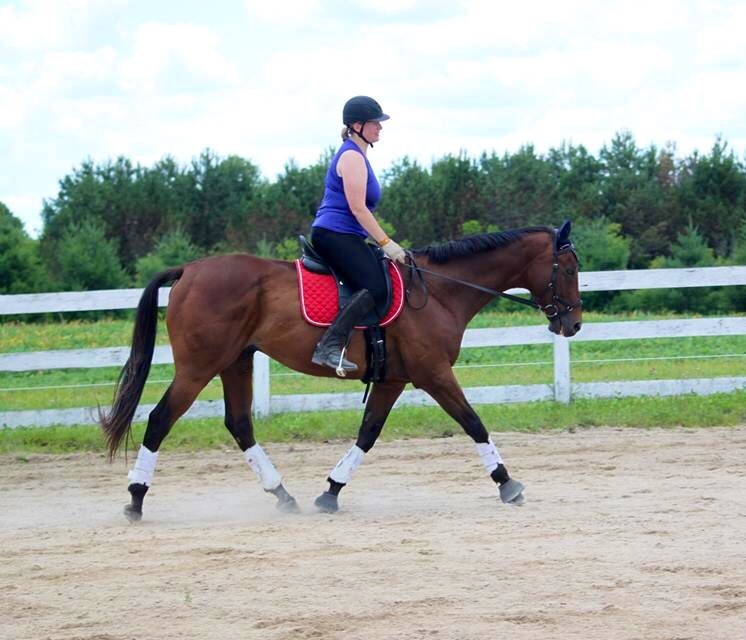 Natalie is a lovely rider, and she’s put herself into a bootcamp of sorts, riding as many horses as she can. 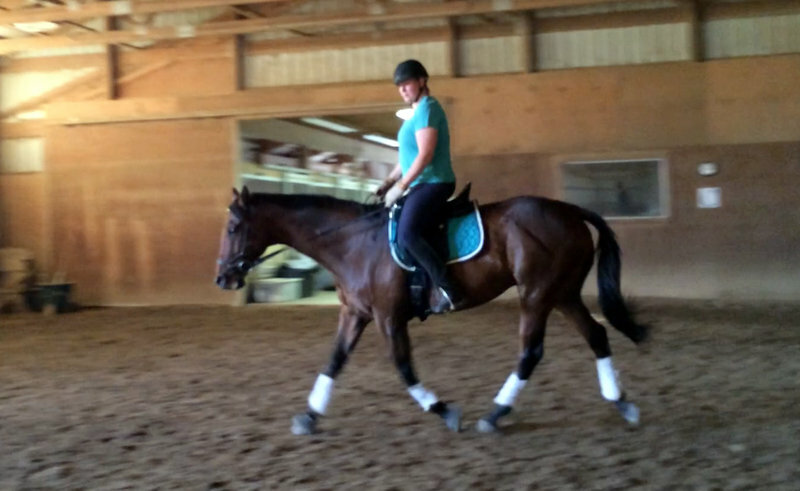 I offered her Derbs during my insane travel schedule this fall, and while she seems to have enjoyed riding him, I’m the one who benefitted, as she has done something I struggled to do myself – she’s reinstalled the Go button. 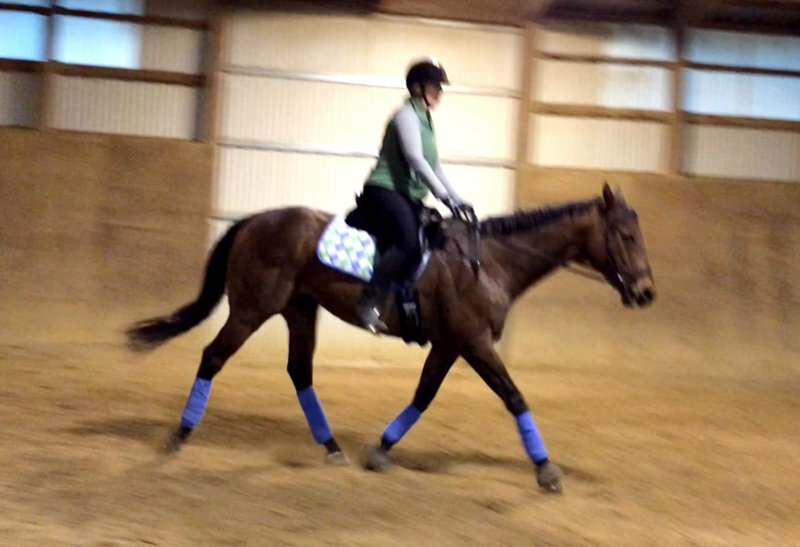 He’s more forward and responsive, and as such, is easier to ride correctly. 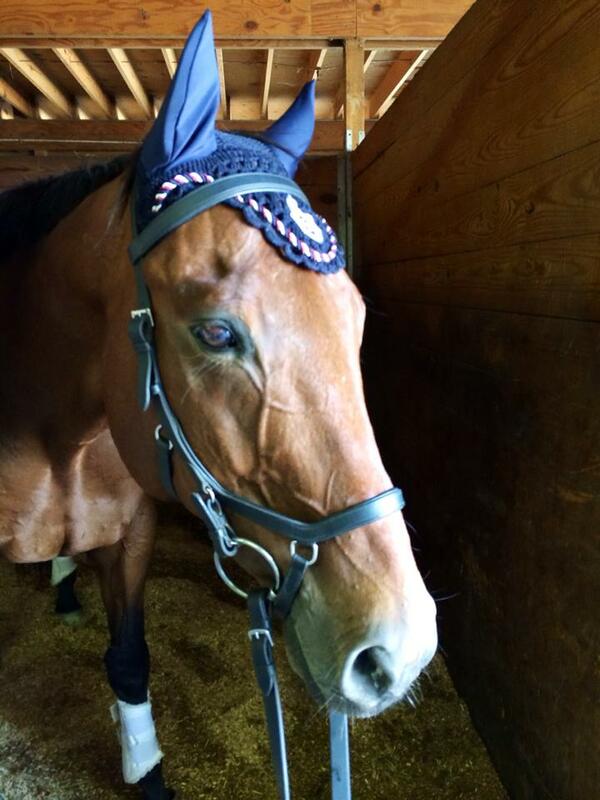 Natalie is also a fellow blogger, writing with grace and good humor about her equestrian ventures here: The Best Mare. Okay. So back to my progress. As I mentioned previously, the pressure was on, due to the impending weather and inevitable frigid temperatures. So, between the imperative to get my sh*t together and ride, I made getting Derby onto my aids my priority. And you know what? That works pretty well. Christy posited – and I tend to agree – that the last few months, while they may have felt like steps backwards, were actually spent filling gaps in my skills. I’m using my new tools, she says, and am riding more consistently and correctly than she’s ever seen me do. I’m happy with the progress I seen on the video, but I’m happier still with the feel – and the feedback – I’m getting in the saddle.